I dropped in on my old friend Darlene Traviss at her new facility, Flip Factory in N.E. Calgary. Her club is staying away from competitive Artistic gymnastics. But they offer just about everything else. Preschool makes up about 60% of the membership. 5,600 square feet of gym space which houses: 4 full size trampolines, a 40′ tumble track, a 40′ x 40′ sprung floor exercise space, a large foam pit, indoor toboggan hill for preschoolers, 40′ bouldering wall, beams, low tight ropes, slack lines, bars (including a pit bar), lots of climbing ropes, rings and vaulting apparatus. An additional 2000 square foot mezzanine space houses our Tot Drop-In during the daytime. This area is filled with equipment specially designed for 1 – 5 year olds: Mats of all shapes and sizes, slides, climbing apparatus, ball pits and more. Equipment configuration and pieces change weekly. This gym is well padded and encourages movement and exploration. A seating area for parents built into the space makes it a perfect spot to hang out with friends while letting preschoolers burn off energy! The mezzanine space is cleared and available to other groups in the evenings. A 750 square foot hardwood dance studio is used for our fitness classes and is also available to other groups. Two spacious birthday party rooms are available for eats and treats after activities in the gym are finished up. CONGRATULATIONS Darlene. I’m completely impressed. 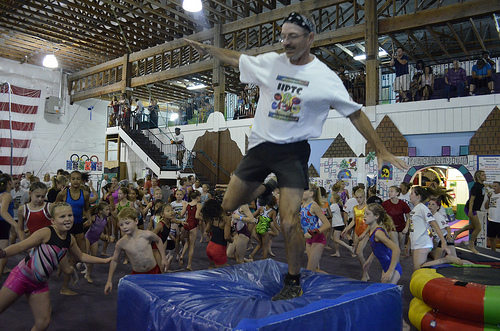 Flip Factory provided excellent Staff, Amazing Space & Fitness Programs for all the kids regardless of age. As a special bonus we all got to enjoy a Reptile Awareness Show in the studio. Great stuff Thx Dar & Team Flip?! I visited Lieven Vercruyssen, founder and chief evangelist of Eurogym Belgium and EuroTumble.com. I tagged along with Lieven to Gymclub Apollo in Antwerp where he set up an Air Floor for the coaches and gymnasts to test. Lieven is expert in setting up and deflating as quickly as possible. The kids got in on the fun. Apollo is a set-up, take-down gym in a school. With limited storage. An Air Floor is ideal in their situation. Click PLAY or watch different kinds of athletes using Air Floors on YouTube. Eurotumble is the distributor of TumblTrak in Europe. Here’s a sample of what different kinds of kids can do on an Air Floor. Eurotumble is a division of Eurogym Belgium, though they distribute throughout Europe. And the world. Founder and chief evangelist Lieven Vercruyssen was kind enough to host me recently, show me a number of clubs in Belgium … and even bring me along on a club visit where kids at Apollo in Antwerp got to test an Air Floor for themselves. Eurotumble.com is a distributor for the American company Tumbltrak. Is trampoline a good activity for participants with special needs? Find out on a new site out of the U.K. dedicated to the topic. It already has a surprisingly number of links. Click PLAY or watch the promo video on YouTube.